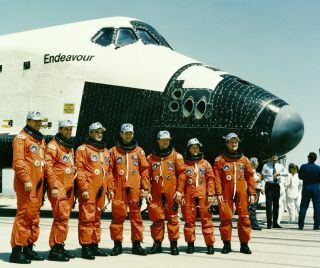 The STS-49 crew members pose near Endeavour after landing. Pictured left to right are: mission specialist Richard J. Hieb, pilot Kevin P. Chiltin, commander Daniel C. Brandenstein, and mission specialists Thomas D. Akers, Pierre J. Thuot, Kathryn C. Thornton, and Bruce E. Melnick. On May 7, 1992, the baby to NASA's space shuttle fleet, the orbiter Endeavour, blasted off on its maiden flight. Today, nearly 20 years later, Endeavour sits on the launch pad at NASA's Kennedy Space Center, mere days away from launching on its final voyage to the International Space Station. Endeavour is slated to lift off on its final flight – STS-134 – on Monday (May 16) at 8:56 a.m. EDT (1256 GMT), after a two-week delay due to a malfunction with the heaters used to protect the shuttle's hydraulic power system. On the nine-day flight, Brandenstein and his crew, pilot Kevin Chiltin, and mission specialists Richard Hieb, Thomas Akers, Pierre Thuot, Kathryn Thornton and Bruce Melnick, salvaged the Intelsat-VI communications satellite, which had been caught in low-Earth orbit after it had failed to properly separate from the first stage of its Titan rocket. SPACE.com: Take me back to 1992. What was it like to command a vehicle on its maiden voyage? SPACE.com: The pictures from the STS-49 mission, especially during the three-person spacewalk, are incredible. After you and your crewmates discovered the tools to retrieve the satellite didn't quite work as they were intended, you had to improvise a bit. What do you remember most from that part of the mission? Brandenstein: The first day when we had no success, we felt really bad about it because we thought that was it. But 30 minutes later or so, they called up and said the satellite was back under control and we could try again tomorrow. On the second day, we had a little more training and some lessons learned, and we tried six times before the satellite was kind of running out of control. We backed away from it again, but we didn't feel quite as bad because we knew they could get it under control again. The question is, did we have enough fuel to come back and do another rendezvous? We did, so as commander, I suggested to the ground that we take the day off and come back with a different plan. Endeavour's STS-49 crew captures the INTELSAT VI satellite above the shuttle's payload bay. At that time, theoretically, we were supposed to be going to bed on orbit. So, we turned off all the lights and let the ground think we were sleeping. Generally, they can tell. If you're not careful, or if you flip a switch on anything, they can tell if you're awake or not. So we tried to pretend like we were sleeping, then Kevin Chiltin, who was my pilot, floated back and we started looking out the back window. And then before you know it, a couple heads come up out of the mid-deck. We had the whole crew there, looking around at our natural resources. What do we have out there that we can use, and what approach can we use to try something different? We came up with this three-person approach, and when we told the ground, they fine-tuned the positioning. One of the big challenges was we were having three people out on a spacewalk – the shuttle wasn't configured for that, and it had never been done before. SPACE.com: How did you manage to get around that? Brandenstein: The mission was originally scheduled to have four spacewalks, and we had two spacewalking crews, so luckily we had four suits. Two of them were in the airlock and two were outside just in the cabin. We took the third suit in, but while you're in there, there's an umbilical to plug in and get cooling and oxygen. Since we only had two of those and three people, we had to do it like scuba diving, and "buddy breathe." We put the umbilical on one, ran it for a few minutes, got his suit full of oxygen, then we put it on the other guy for a minute or two and went back and forth like that. When we got them out there, we had one guy on the end of the arm, and two in foot restraints and hard mounted. So, they were three points around the satellite, and we just flew up to it and did another rendezvous. The satellite was wobbling a bit, but the vehicle is incredible, and you can move it just inches. I flew it down and got the timing of the wobble so they had the satellite in front of their nose and they just reached up and grabbed it. Once we had the bar latched, we could grab it with the mechanical arm and position it over this rocket motor. Then we just bolted it and it had a spring-loaded ejection, so we could deploy it, the springs would pop off and the thing floated away. Then we flew away and a little while later, they lit the motor and took it up to where it was supposed to go in geosynchronous orbit. SPACE.com: That sounds absolutely thrilling. Was there ever a time when you didn't think the mission would work out? Brandenstein: I always tell people that the mission was really fun once we knew the ending. There was a stretch where we weren't so sure. This image shows OV-105 being rolled out after the build at the Rockwell Palmdale facility on April 25, 1991. SPACE.com: How would you characterize Endeavour's career and its contribution to the space shuttle program? SPACE.com: As you look ahead to the end of the shuttle program, what are your thoughts on NASA's future and the future of human spaceflight? Brandenstein: The way it's being done distresses me, I guess. In my whole career in the Navy and everything, you don't shut down a system before you have a replacement system. And now we have this truly capable laboratory up there, the space station, and it's like we're cutting off its blood supply. Originally it was designed that the shuttle was going to take racks of experiments up and down. We don't have that capability anymore. Yeah, they'll be able to do experiments, but it's not optimized in my mind. It distresses me that we don't have a plan for that. From the point of view of being the chief operating officer of United Space Alliance, we're laying off tons of people. And these are critical skills that it takes to operate and maintain a space vehicle, and design new ones. With all that going away, you can't just go down and rent an engineer and bring in the type of expertise and knowledge that you need to develop a program for exploration or something like that. I think we're all disappointed with where it's going, but you don't see that in their performance. The shuttle teams are truly dedicated. The vehicles are getting better because we're understanding them better, and they've matured very nicely. So, it just doesn't make sense to stop flying them until you have something to replace them, and we don't. It's not there yet. SPACE.com: Looking back on your career, you flew almost all the orbiters in the fleet – STS-8 on Challenger, STS-51G on Discovery, STS-32 on Columbia and STS-49 on Endeavour. Is there ever a part of you that thinks: if only I had that one more mission on Atlantis? Brandenstein: When I decided to retire, that entered my mind: I could be one of the few guys who flew them all. But, there were a lot of other factors. If I was going to start another career, I probably didn't want to wait any longer. And, the stress of flying in space on the family is a lot more significant than on the individual doing it. My wife had put up with me with five years flying combat missions, four years of being a test pilot, and four shuttle flights. I figured I owed my family consideration too. Every mission I had had new and different challenges. After a mission like STS-49 with Endeavour, I was looking ahead at the next two or three years down the road, and there wasn't anything that presented a greater challenge. I'm one of those type-A guys who likes challenges, so that factored into it too. But yes, I did think about it. That was part of the thought process, but in the end I passed on it. SPACE.com: Since you were the commander of Endeavour's first mission, are you a bit more protective of it than the others? Do you kind of think of it as your baby? Brandenstein: Oh yeah. When you get to fly it for the first time – I mean, I flew four of them, but it's your favorite because you were the first one. I have a picture hanging on my wall from when it was delivered to Florida. It was on the back of a 747, and all the tiles were just glistening black. After you fly them once and they come back through re-entry, they get all scorched. But it was pristine then. And I got to scorch them for the first time (laughs). SPACE.com: So Endeavour is your favorite then? Brandenstein: Yeah. For that reason, yeah. And, it really performed like a champ when we needed it to.